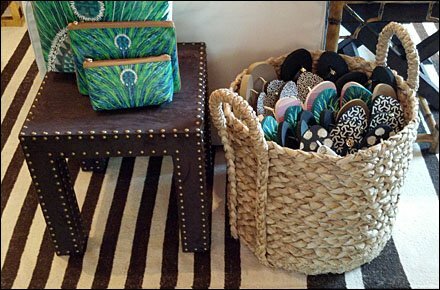 A very homey theme presents itself with Flip Flops offered for sale by Wicker Basket. I liked the decor, but the Flip Flops were so recessive that they communicated no selling proposition. A small tasteful sign, or even a single Flip Flop sitting atop would add emphasis. Still an unusual and creative display. CLICK the thumbnail for a closeup view.